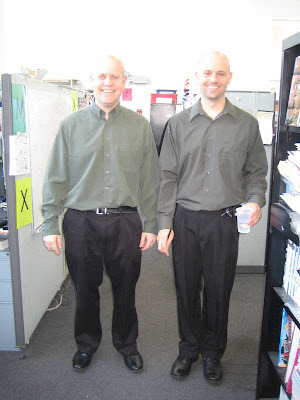 People seemed to think that Erik and I dressed alike on Wednesday. You look very creepy. Like, molester-creepy. Maybe it's the grin? No. Maybe it's the bald head? No. I got it... it's a mix of the grin, baldness plus the giant bulge in your pants. And we all know what THAT'S from!! Is this a glimpse into your future? Um, nice look. I took the hair from my head and put it in my pants. Did you actually shave your head or is that a latex cover? I can't tell by the picture. But, you definitely have the Uncle Fester look down pat. Nice breeches Doug. Going riding? Think the germans wore those a few years back. WWII reenactment after work?